The state of recycling in Chicago is fairly pathetic, but perhaps this map can help you find out how you can help bring stuff in. Unhappy with the state of many websites to just give easy to read and use information on recycling in Chicago, I made my own. Besides, it allowed me to figure out how to use the Google Maps API. Paper = Newspaper, Cardboard, Office paper, Junk mail, Phone books, Magazines, and Chipboard. Glass = Glass bottles, clear or colored. Plastics = #1 and #2 plastics. Metals = Aluminum cans, aluminum foil, tin cans. Steel = Steel cans only. 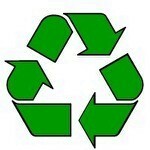 Recycle Centers, Bicycle Recycling, Recycling Services, Inc. Locations: All | North Side | Downtown | South Side Also: You can take old batteries in to any Public Library or Walgreens, and most grocery stores recycle plastic bags.